Recycled engines come complete with valve covers, intake manifold, oil pan, and timing covers. Vehicle identification numbers are provided for each recycled engine. Mileage is documented for each engine. All engines are cleaned and drained of all fluids. Each engine is tested to verify that the engine has good compression. Engines are run in the vehicle prior to removal when possible. All engines have a 90 day parts replacement warranty. Ask about our coast to coast extended warranty program! Recycled Transmissions come complete with tail shaft and housing, valve body, all internal components and the torque converter. Each transmission is professionally removed, drained of all fluid, and the fluid visually inspected for debris. The torque converter is drained, visually inspected and locked back onto the unit with a bracket. All transmissions have a 90 day parts replacement warranty. Recycled Axle Assembly is complete drum to drum or caliper to caliper. Each Axle Assembly is professionally prepared. The fluids are removed and inspected for debris and the gear ratio is verified. Mounts and housing will be inspected to ensure they are not twisted or bent and will be inspected for rust. All Axle Assemblies have a 90 day parts replacement warranty. 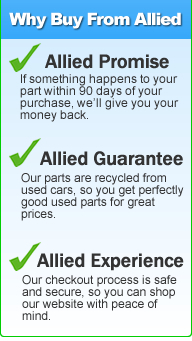 Allied Auto has more than a decade of electronic rebuilding experience. Our professionally trained technicians are the best in class. Our standard is excellence to ensure that your item will be rebuilt properly the first time. There are many rebuilt items in stock and ready to ship or we can professionally rebuild your item. Expedited service is available for all items. All rebuilt items have a 1 year parts repair warranty. New items added frequently – call today for availability! We stand behind each item that is rebuilt in our facility. All rebuilt items come with a 1 year parts repair warranty. We also provide support in helping to solve related electrical problems that may contribute to electrical failure. Due to extremely high demand our rebuilt items change daily. Call us for availability at 877-784-0057. What components are replaced during the rebuilding process? All items that we rebuild are a result of years of professional research and development. We not only replace defective components in your unit, but each item is rebuilt to our exact specifications. How long does it take to rebuild my item? Depending on what part of the country you live in the unit will take between 2-12 business days to rebuild and return back to you. How long is the warranty on rebuilt items? How do I know what items can be rebuilt? We rebuild many types of items for many different vehicles and we are adding new items daily to serve you better. Please call our office to determine if your item can be rebuilt. What is the first step to getting my item rebuilt?